Before shaving, rub a small amount of The Art of Shaving Pre-Shave Oil in the palm of your hands and massage into beard. Lather Shaving Cream or Shaving Soap over oil and shave. Use approximately a nickel-size dollop of Pre-Shave Oil per application. Wash hands after applying oil to face. Ricinus Communis (Castor) Seed Oil, Olea Europaea (Olive) Fruit Oil, Fragrance/Parfum, Water/Aqua, Coumarin, Hexyl Cinnamal, Alpha-Isomethyl Ionone. Once obtaining the product i saw instant results and a drastic reduction of razor bumps. a small amount covers plenty which makes this jar last for quite a while. *i was in a rush one day and forgot to rinse my face thoroughly after shaving and the heat from the weather combined with the oil caused a mild breakout, but other than that, it's an excellent product. This conditioner is just perfect for preparing the skin, before you apply shaving cream. It softens the hair and makes the skin more supple. The razor will glide over the skin and reduce the occasional nick. Smells SO GOOD for him and her! 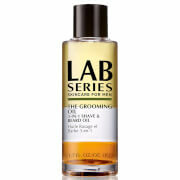 This is one of the best pre-shave oils on the market. It only takes a small drop to cover your whole beard and it provides excellent protection from blade burn. The only caution is a little goes a long way, too much oil and your blades dull quickly! Both the boyfriend and I can share this oil - not feminine, not manly just perfect! Highly recommend. Product is good for sensative skin. Helps the razor glide a lot smoother. I don't have problems with ingrown hairs anymore. The use of this oil, somehow softens the hair and makes shaving a lot more pleasant. Once your done, the shave feel a lot closer, and it gives a smoother feeling.